2nd Law Muse Album Full Free Download - The 2nd Law is the sixth studio album by English alternative rock band Muse, which was released throughout most of the world on 28 September 2012, and in North America on 2 October 2012. "We are defined by the fact that we can't be defined by anybody," says Matt Bellamy, the singer-guitarist-pianist of Muse, as he runs down the range and nerve of the British trio's new album, The 2nd Law, out in October. "There are electro-pop sounds and songs that are obviously classic rock," Bellamy notes, referring to the machine-funk nightmares "Madness" and "Panic Station" and, in the latter category, "Big Freeze" and his lead-guitar blowup in "Animals." "Then there are the orchestral things," he adds over lunch in New York: the strings-choir-and-metal "Survival," already a hit as an official Olympic theme song, and the symphonic chaos of the two-part title suite. The 2nd Law would sound like "three different bands," Bellamy contends, "if it wasn't for my voice." Bellamy, bassist Chris Wolstenholme and drummer Dominic Howard recorded most of the follow-up to their 2009 U.S. breakthrough, The Resistance, in London last year, then did overdubs in L.A. with David Campbell, whose arranging and conducting credits include albums by Metallica and his son Beck. "He understood that film-music thing we were looking for," Bellamy says. "And he found a lot of amazing people," including a trumpeter who played on Stevie Wonder's "Superstition." 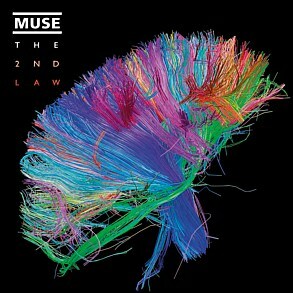 But it was in London, as Muse started work on The 2nd Law last summer, where Bellamy found his title and main theme. He was watching a panel of economists on the BBC when someone on the show referred to the second law of thermo­dynamics. "He said, 'The laws of physics say that an economy based on endless growth is unsustainable,'" Bellamy says. "Everyone is obsessed with constant, unchecked growth, and no one is pointing out that we might be maxing out. "'Survival' tunes into the insanity of that," Bellamy adds. Another song, the piano-based ballad "Explorers," "looks at the other side of the coin, this adventurous spirit we've created that is now in question, because the planet is saying, 'I'm only so big and have this much.'" There are breaks in the apocalypse. "Follow Me" is a dreamy plea with an unusual pulse: the in-utero heartbeat of Bellamy's son with fiancee Kate Hudson, recorded on an iPhone, the father says, "just before she pushed him out." And "Save Me," one of two songs written and sung by Wolstenholme, suggests the Beach Boys circa Pet Sounds. "It's a new sound for us," Bellamy says with a smile. "It makes for a nice change." The 2nd Law received favourable reviews from music critics. On Metacritic, which assigns a normalized rating out of 100 to reviews from mainstream critics, the album received an average score of 70 based on 28 reviews, indicating "generally favorable reviews." The Guardian's Alexis Petridis rated the album four out of five stars, complimenting the band's ambition but finding fault with the album's bombastic tendencies which were also present on their previous albums, stating "no one goes to see a blockbuster for its profundity and deep characterisation. They go for the stunts and the special effects, both of which The 2nd Law delivers." BBC music critic Ian Winwood also gave the album a positive review, highlighting "Supremacy", "Liquid State" and "The 2nd Law: Isolated System", saying that Muse "present themselves in any guise they please". The Telegraph's Helen Brown rated the album four out of five stars, noting the album's eclectic influences and reserving praise for "Madness" in particular.The Observer's reviewer also alluded to Muse's bombastic tendencies, saying "Bellamy is not blind to the contradictions of his band's attempts continually to ramp the ludicrousness up to 11; endless growth is, of course, unsustainable. But for now they remain pretty comfortable with the idea of obscene over-inflation. So should we." Allmusic rated the album three out of five stars, noting "their excursions into dubstep and dance music on tracks like "Madness" and "Follow Me" feel more like remixes than original songs. Songs like these definitely have the spine of Muse tracks, but the production that's built up around them feels almost alien." Kyle Anderson of Entertainment Weekly gave the album a grade of C+, claiming that "the band goes overboard with Queen-isms" and expressing disappointment at the lack of electronic music elements compared to the band's expectations that the album would be a departure from previous releases. The album was a nominee for Best Rock Album at the 55th Grammy Awards, which were held on 10 February 2013. The song "Madness" was also nominated for Best Rock Song. The album was listed at #46 on Rolling Stone's list of the top 50 albums of 2012, saying "In an era of diminished expectations, Muse make stadium-crushing songs that mix the legacies of Queen, King Crimson, Led Zeppelin and Radiohead while making almost every other current band seem tiny." The album sold around 475,000 copies worldwide on its release. It debuted at number 2 on the Billboard 200 with 101,000 copies sold in its first week, giving Muse the highest charting debut of their career in the US, although it sold fewer copies than the debut of their previous album The Resistance, which debuted at number three with 128,000 copies. It also debuted at number 2 in Australia, Germany, Ireland, Korea and Spain. The album gave Muse their fourth number 1 debut in the UK, while also debuting at number 1 in 13 other countries. It has sold 255,000 copies in the UK in 2012. The album sold 1,400,000 copies becoming the 26th best selling album of 2012 worldwide.